It’s time to look at a film about a custody battle. You’ll have to decide which Kramer you’re rooting for and then go from there. Interestingly enough the film doesn’t opt to go for the classic apperoach of having each parent get 50% screen time and shifting perspectives. In this case the main character is always Ted but Joanna shows up from time to time to spook them all. It’s a decent film I suppose, but one where it is tough to root for someone too much since both seem to be pretty flawed. The film starts off with Ted having another late night at the office. Still, he is pretty pleased with himself since he finally landed a big contract. He goes home to celebrate with his wife Joanna, but she has decided to move out and start the divorce proceedings. She tells Ted that he has to look after the kid since she can’t handle any liabilities right now. Ted is now determined to be the best parent he can be. There are ups and downs, but he is finally starting to get the hang of it. That’s when Joanna returns and demands that their son move in with her. Billy doesn’t really know who he wants to be with since the situation is way above his head. It’s time to see what the judge has to say about this. As you may or may not know I’m not a big fan of kids getting a big role in films. They certainly can’t act and most of their scenes tend to be annoying. Unfortunately Billy is no exception. He comes across as very spoiled at times like when he tries to steal some ice cream instead of eating his dinner. Things had been going pretty well so why would Billy pull something like that? His character doesn’t seem to have a whole lot of agency since he’s so young and can’t weigh in on these topics. Then he tends to get very emotional very quickly as well. All in all, that just isn’t a recipe for success. Then we’ve got the parents. Joanna was too far gone for her redemption arc to work at all. She’s the one who ditched Billy so it’s a little too late to come back and try to get him now. Moreover, she’s already dating some other guy so she didn’t waste any time in doing that. It’ll make for a very awkward household for Billy and since she may also be moving he’ll have to get used to a new school. Of course, she does try to act like she feels bad for Ted at times, but you can probably feel a bit of a smirk beneath her gaze. Ted certainly isn’t faultless either though. He does a good job of looking after Billy by the end, but his multi tasking skills do not seem to be particularly good. He apparently messed up on every project after that so you can see why he was let go. THe boss was pretty petty about when he fired Ted as he seemed to do it just to get the lead in a bad spot, but Ted should have done a better job of balancing both of his main duties. I also think Billy inheireted Ted’s temperment as he tends to throw stuff when he gets upset and he gets upset a lot. The judge definitely had a tough choice here because either way it’s not like any option is perfect, but that’s why he is paid the big bucks. The lawyers were definitely pretty intense. I’d say that they were both pretty evenly matched as well. They weren’t afraid to go for the low blows if it meant winning the case. This is another moment where Ted and Joanna didn’t seem quite as resolved as they should be. Look, it’s tough to take the personal shots, but the stakes are high enough where they should be able to roll with it. They do want Billy right? The ending is left to a bit of interpretation on how exactly you think it plays out. I personally think the film was leading up to a surrender where Ted would find out that he gets Billy after all. Of course you could also take the opposite approach and believe that Ted is now doomed. Either way, an open ended final scene like this can work well for this kind of movie since whoever you were hoping would win can still win in your head. The writing is pretty reasonable although of course there are parts of the film that can be a bit annoying. One is the annoying gimmick of the characters heading to the bathroom. The main part that hurts this scene aside from the crude aspect of it is that neither character washes their hands upon leaving the bathroom which is pretty unhygienic. Then the characters head immediately for the kitchen where they make a lot of food with their hands. You won’t want to eat any of that. It’s even worse then the other thing films make you believe is okay like tasting the food that you’re cooking and then putting the spoon back in. Don’t pick up any of the bad habits you see in this film folks. 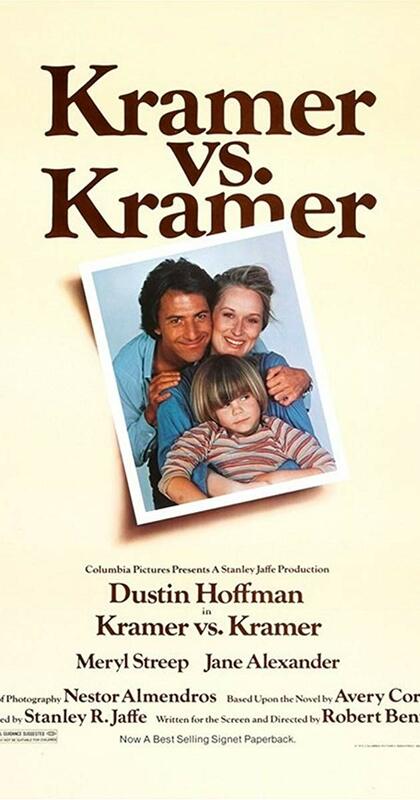 Overall, Kramer vs Kramer is definitely a decent film. It’s quite a bit different from the more over the top slapstick comedy neighbor vs neighbor battle I was expecting. I think I ended up mixing this one up with a different movie. Custody battles like this are rarely very fun so it does limit this film’s enjoyment factor to a degree as well. I wouldn’t call it a bad film though and if this premise sounds interesting then you should check it out. This entry was posted in Live Action Movie Reviews, Live Action Movies, Reviews and tagged Custody Battle, Drama, Dustin Hoffman, Emotional, Film Review, Movie Review, Review by dreager1. Bookmark the permalink. Doesn’t sound too bad, but at the same time, a little too realistic. Probably hang out at a courthouse for a day and see far too many stories like this.